Solar-powered aeroplane Solar Impulse 2 has touched down in California after a three-day flight over the Pacific Ocean from Hawaii. The experimental plane is flying around the world without fuel and is now one leg closer to completing its trip. The aircraft started its around-the-world journey in March 2015 from Abu Dhabi, the capital of the United Arab Emirates, and made stops in Oman, Myanmar, China and Japan. It's on the ninth leg of its circumnavigation. 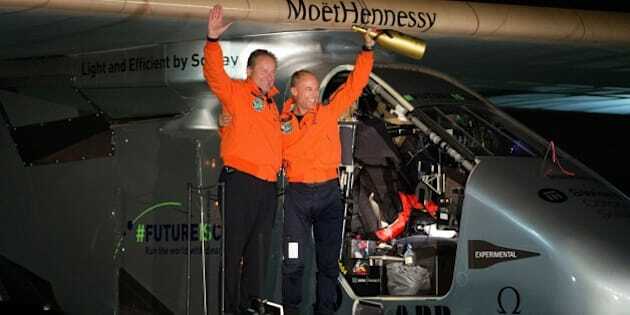 Pilot Bertrand Piccard marveled from his plane as it cruised over the Pacific at about 16,000 feet with a nearly-full battery, according to the website documenting Solar Impulse 2's journey. Earlier, he exchanged pleasantries with UN Secretary-General Ban Ki-moon, who hailed Piccard's pioneering spirit as "inspirational,'' telling him he was making history. Piccard responded that Ban, too, was making history by having just presided over the signing of a climate agreement supported by representatives of 175 nations. After uncertainty about winds, the plane took off from Hawaii on Thursday morning and was on course to land in Mountain View, California, over the weekend. The crew that helped it take off was clearing out of its Hawaiian hangar and headed for the mainland for the weekend arrival. At one point passengers on a Hawaiian Air jet caught a glimpse of the Solar Impulse 2 before the airliner sped past the slow-moving aircraft. The Solar Impulse 2 landed in Hawaii in July and was forced to stay in the islands after the plane's battery system sustained heat damage on its trip from Japan. Piccard, said the destination in the heart of Silicon Valley is fitting, as the plane will land "in the middle of the pioneering spirit.'' Piccard's co-pilot Andre Borschberg flew the leg from Japan to Hawaii. The team was delayed in Asia, as well. When first attempting to fly from Nanjing, China, to Hawaii, the crew had to divert to Japan because of unfavourable weather and a damaged wing. A month later, when weather conditions were right, the plane departed from Nagoya in central Japan for Hawaii. The plane's ideal flight speed is about 45 kph, or 28 mph, though that can double during the day when the sun's rays are strongest. The carbon-fiber aircraft weighs more than 5,000 pounds, or about as much as a midsize truck. The plane will now cross the U.S., with the next stop New York.